I just could not get into 360 at all. Way too much politics. And I think Anderson needs to lay off that Eddie Bernice Johnson story. We all know she's an idiot, do we have to hear about her so much? 360 needed better story selection last nite. Hope tonite is better. I like Anderson in the jeans and sneakers. He's doing what is comfortable for him and being himself. I like it. I flipped back and forth between 360 and Lawrence O'Donnell, at the start I stayed with O'Donnell's interview of VP Biden because I was not impressed by 360's so-called "Breaking News" of Rahm Emanuel leaving the Obama WH and maybe running for office in Chicago. Many news programs including CNN reported this in the middle of last week. Anderson's best report was the "Distorting the Truth" and discussing political ads with Begala and Castellanos. I've got one more Begalaism; "The soul of America is not in Congress." However, I missed what made the scholarship scandal involving Rep. Johnson *new* news and went back to O'Donnell, who was doing political analysis with Olbermann. While O'Donnell showed more of his interview with Biden, Anderson and panel discussed the mosque controversy in Tennessee. I wish they had talked about specifics of the new lawsuit with Jeffrey Toobin instead of re-hashing general points about muslims, mosques and how people feel about them. In the middle of his show, O'Donnell had a line-up of big names he'd be interviewing this week, like Bob Woodward and Mayor Bloomberg. Nice info to try to get viewers to come back. The 360 report on U.S. soldiers killing Afghan civilians should have led the show, I guessing Drew Griffin had a good report but I watched O'Donnell on conservatives reactions to Colbert testifying before Congress last week, kind of old news but I loved O'Donnell's challenge to Rep. Hoyer (I think it was Hoyer). At the end of his show, O'Donnell showed the SNL clip spoofing Christine O'Donnell ("no relation" he kept having to say) and Anderson had the video of the rough landing of that Atlanta-NYC filght. I had seen both of videos several times before but O'Donnell gets a bonus point for talking to an SNL guy in the last two minutes of his show, a time (57 or :58 past the hour) when 360 is already over. O'Donnell did a pretty good job. I was hoping Anderson would have added a little more strength or pizazz or something to 360 to keep me there the whole hour. The highlight of 360 was the panel on Rahm Emanuel and yes Paul Begala's quotes. AC at one point called him "Peter," but that's beside the point. Emanuel's leaving is not a surprise to me. I read somewhere early last year, that he missed his family who stayed back in Chicago and he was the most important "go to person," for the Obama White House. His presence will be missed I'm sure. Ken Jautz seems like a very reasonable and FAIR minded person. He was sure to use the words TEAM and SANJAY when speaking of AC's reporting in Haiti. He realized immediately that Anderson did not do the "brilliant reporting" alone and gave the "team" credit. I like him already. Keen observer. I also like and absolutely agree with your "dress for success" commentary. I get the feeling that Anderson dresses down because he's actually daring anyone to tell HIM how to dress. If he can wear a suit to co-host R&K, then he should be wearing one on CNN, unless Mr.Jautz tells him otherwise....let's see how it starts to play out shall we. New boss, new rules. Thank you Jaanza for comparing the two shows. Lawrence O'Donnell was chosen because he already had the smarts to go head to head with Anderson and he always filled in for Olberman. Someone was thinking ahead at MSNBC. Maybe thats why CNN is third. By the way did you notice if O'Donnell was wearing "jeans?" Last night was just OK. I just could not get into it except for the Drew Griffin story. That just sickened me and really upset my Hubby who retired from the army after 20 years. That is something else that is wrong with 360. No negative comments allowed against its anchors and it wasn't a mean comment, just that I didn't like it. I guess I'm a bad fan. I really don't pay too much attention to what he's wearing, but when I do notice the jeans, I actually dig them. Paul really was great. Loved the lamp post line. I like the political ad reports. I think breaking down the truth for a variety of campaigns is far better than just hammering away at one candidate in Delaware. The military story was fascinating. I perfer those stories with real reporting instead a lot of manufactured drama. It's difficult for me to watch any report by Drew Griffin, but the story on the accused soldiers in Afghanistan was chilling and well done. Alex Castellanos is another pundit I don't agree with, but he does have a pretty good sense of humor when he's paired with Paul. 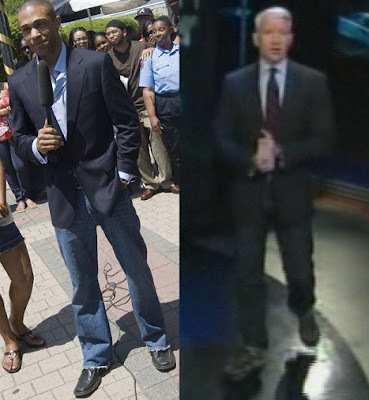 Anderson's jeans and sneakers don't bother me a bit, I like the look, but if he's forced to change because complaints from viewers or the boss, that's the way it goes. I do agree with Judy's point about Anderson possibly being defiant in his choice of clothing and I find that sort of amusing, but I realize that others here and elsewhere do not. Maybe if Anderson is going to wear jeans he should wear shoes like Don Lemon does. Anderson looks good like that, but it looks like he just rode to work on his bike and changed his shirt and added the jacket/tie. Now he is all ready in a second to leave work casual. Sorry, I put my Lawrence O'Donnell ratings on the post prior. Anderson looks hot in jeans and tennies. Rolled cuff jeans came into fashion on the coasts this summer. It may not have hit your area of the country yet.